Mr. Zuber focuses his practice on medical malpractice, serious personal injury, and wrongful death cases all throughout Maryland and the District of Columbia. He has a great fascination with medicine and enjoys researching and writing about complex medical malpractice issues. A native of Philadelphia, Mr. Zuber performed his undergraduate studies at Dickinson College in Carlisle, Pennsylvania. He graduated from Dickinson in 2005 with a bachelor’s degree in English Literature. From there, Mr. Zuber attended Widener University School of Law in Wilmington, Delaware where he graduated with honors. Prior to joining Miller and Zois, Mr. Zuber honed his litigation skills while working for two different firms in Maryland. 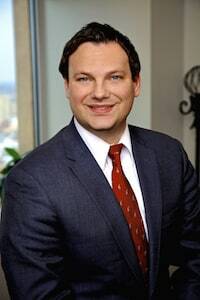 He has represented clients all throughout the state of Maryland in personal injury, workers compensation, real estate, and commercial litigation matters. He has extensive trial experience in Maryland District and Circuit Courts. Mr. Zuber has also handled several cases in Federal Court and on Appeal. Mr. Zuber is currently licensed to practice law in Maryland, the District of Columbia, and the United States District Court for Maryland. Mr. Zuber lives in Howard County, Maryland. An avid runner, Mr. Zuber competes every year in several marathons and half-marathons for charity. In his free time, he enjoys spending time with his wife, Brooke, and their three dogs, Cara, Emily, and Cooper. You can reach Justin Zuber at at 800-553-8082 or at justinzuber@millerandzois.com.